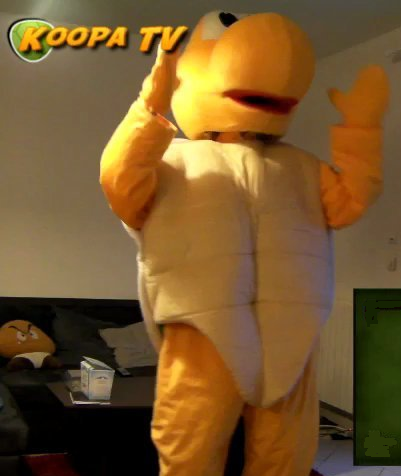 KoopaTV: Happy World Turtle Day! By VORTEXICA - They have holidays for everything these days, but this one actually has a point. You're in a desert, walking along in the sand, when all of a sudden you look down and see a tortoise crawling towards you. You reach down and you flip the tortoise over on its back. The tortoise lies on its back, its belly baking in the hot sun, beating its legs trying to turn itself over, but it can't. Not without your help. ...But you're not helping. Why is that? Okay so now that we've got that tangentially turtle-related, comedically-bankrupt Blade Runner reference out of the way, happy World Turtle Day everyone! Disregard that "Koopa TV" logo. This loser has absolutely no affiliation whatsoever with the real KoopaTV. ...To more practical measures like campaigning for the preservation of turtle habitat and helping to rescue sick, neglected, or abandoned turtles from incompetent owners or perilous situations. 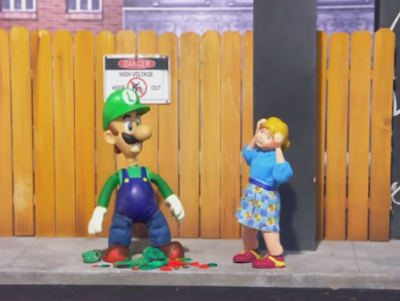 Yes, photographic evidence that the portly plumber brothers are equal-opportunity terrorists, willing to stomp not just Koopa-kind, but anything resembling them to death. In the middle of the street. In broad daylight. Right in front of their owners. Does their racial hatred know no bounds? Let the goodwill and life-preserving message of World Turtle Day be as a wall, worthy of Donald Trump, to shut out all noise and perverse thoughts associated with these fiends' vile activities. We here at KoopaTV will be sombre as we remember our erstwhile social media mascots, the KoopaTV Troopas Claira and Devin, cruelly taken from us almost one year ago. The courage and dignity with which they met their untimely fate will never be forgotten, and with next week also being Memorial Day, this is indeed a gloomy time of year for the KoopaTV staff. 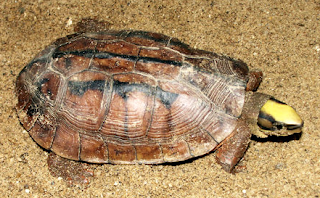 At a time when the world is gripped by threats to turtle-kind such as the ongoing Holocene extinction event (R.I.P. Lonesome George) and out-of-control wildfires burning whole provinces to ash, I'd hope we'd all have more care and respect for turtle-kind on this day of all days. But it isn't all doom and gloom on that front. Erstwhile presidential candidate and apparent turtle enthusiast Jeb Bush ran with a gimmick of carrying miniature turtles in his pockets to hand out to kids with the tag line “slow and steady wins the race.” Unfortunately for Jeb!, his campaign was so slow and steady that he barely got off the starting block. Not even turtle power could save his critically-endangered candidacy. Incidentally, about this time last year I was watching the Channel 4 reality survival series The Island with Bear Grylls, in which a group of ordinary guys are abandoned on a Pacific island and left to fend for themselves for six weeks. Something happened in one episode in particular that really struck a cord with me. Let me tell you, when even 11 marooned, starving British men won't take the opportunity to eat newborn baby sea turtles struggling to take to the waves, you know people hold these creatures in high esteem. ...Of course, some of the poor things unavoidably baked to death in the blistering heat and so were collected by the castaways and boiled in a broth to tender perfection, but they would've only been left for scavenging animals anyway. And even then one of the ravenous waifs refused to partake of the succulent turtle flesh in favour of disgusting LIMPETS. What a champ. Give that man a medal. All this only goes to show that the life of turtles, tortoises, and Koopas can meet a premature end in an instant from any number of sources: cars, pollution, habitat loss, Pac-Man, or the rubbery sole of a mustachioed madman. The ultimate result is always the same. And if you still doubt the credulity of Mario's crimes against turtle-kind, allow me to elucidate further. See that? That's the golden coin turtle, and it's critically endangered in the wild. Hmm, now I wonder who could've been responsible for that? Do we know of anyone that loves grabbing every single gold coin they can get their grubby little fingers on? Anyone? Anyone at all? Whose fault could it have possibly been that there are so few of this species left? Guess we'll never know! So remember, be kind to all turtles and their close kin (even if you're starving to death on a desert island), because there are people (and individuals for whom the term "people" is far too good) out there who most certainly won't be. Ludwig claims the word "turtle" is not common parlance in Koopa Kingdom, but it's still a decent catch-all term for our viewers to understand. Fun fact: Vortexica has never kept turtles as pets, but did once have a couple of snakes, so he has first-hand experience caring for reptiles. Once again, Vortexica wishes you all a happy World Turtle Day! The year KoopaTV celebrates World Turtle Day, the Blast Turtle is discovered in Alola! JEB! 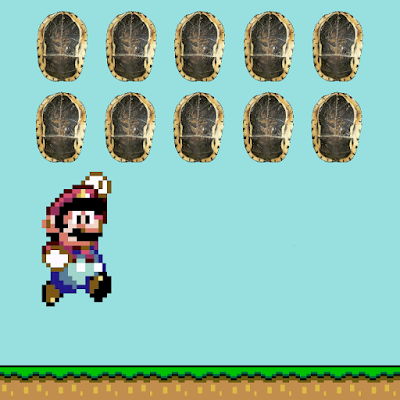 Bush gets a minigame in The Wonderful 1237, where he's represented by a tortoise. KoopaTV stands behind tortoise conservation, even coal-polluting ones. The staff's solidarity with turtles even includes talking a lot about the Dragon Ball franchise on the basis of Turtle's prominence. World Turtle Day returns to KoopaTV in 2018, talking about turtles and Koopas. I admit I started out not being fond of turtles. My brother got a pet turtle due to liking the original Ninja Turtles cartoon and like many young children, was irresponsible. It took years to find a responsible owner. Meanwhile my mother would not let me get any pet higher than a goldfish thinking I would also be irresponsible. A pet I can cuddle and really interact with probably would do wonders for all the pain and loneliness I endured as a child. Eventually my mother for some reason asked if I would like a bird. This was in my late teens already I immediately said yes and eventually upgraded to hamster then to cats. I still had a bit of resentment to turtles for the time being. Even if Shantae and the Pirate's curse never existed I still would have voted against Team Ninjas for Ninja Turtles played a part in me not getting a pet higher than a goldfish for a long time. Same with Team Pizza even if I was not such a Maya Fey fan because of what those Ninja Turtles did to me indirectly and they are obsessed with Pizza. But this place helped me overcome my resentment of turtles. I did have a King Bowser backpack and plush from Nintendo World Store (now known as Nintendo NY) way before I even knew of this site so they might have helped too. I did choose Team Blue (Blastoise on the cover) after all and in the I petted a few tortoises in the aquarium in Rhode Island. It is possible to overcome speciesism. This is exactly the kind of story I like hearing about, and is the whole entire point behind World Turtle Day. It also shows how irresponsible actions from one individual towards turtles can have a knock-on effect on others too, and the fact that KoopaTV played at least some part in helping you get over your dislike of turtles means we must be doing something right, lol. Thank you. And damn, you really held a grudge against TMNT, didn't you? Now I'm glad the only reference I made to them in this article is the single mention of "turtle power". I would like to just take some time to remember all of the koopas who sacrificed their lives for the sake of the kingdom. May they rest in peace on this World Turtle Day. Perhaps one of the other staff members will throw together a more overt article in memory of all the Koopa Troopas who died for their country next Monday when Memorial Day actually rolls around. Or not. We'll have to see. Watch this space.